Achieve professional-quality arches with Maybelline Tattoo Brow Waterproof Gel, a weightless formula that creates a perfecting veil over your brows. The smudge-proof gel applies easily with the precision tip, laying down natural-looking colour that stays put for days. 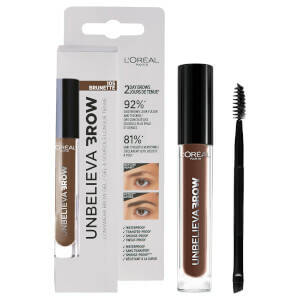 Available in a collection of colour-matched shades, the brow gel feels comfortable and leaves behind expertly sculpted, salon-worthy results. Isododecane, Trimethylsiloxysilicate, Methyl Methacrylate Crosspolymer, Nylon-611/Dimethicone Copolymer, C8-9 Isoparaffin, Disteardimonium Hectorite, Paraffinum Liquidum / Mineral Oil, Propylene Carbonate, Pentylene Glycol, C30-45 Alkyldimethylsilyl Polypropylsilsesquioxane, Caprylyl Glycol, Isopropyl Titanium Triisostearate, [+/- May Contain Ci 77491, Ci 77492, Ci 77499 / Iron Oxides, Ci 77891 / Titanium Dioxide].